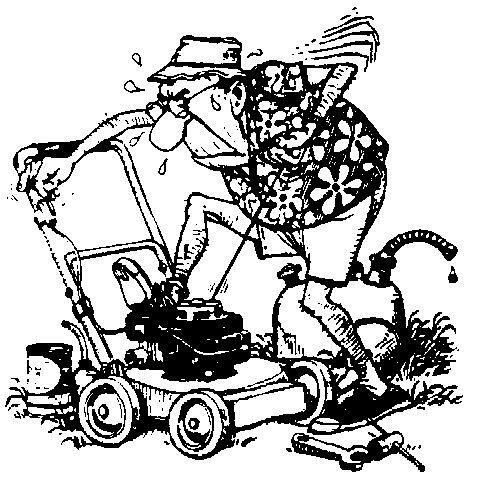 “MILWAUKEE – a 56-YEAR OLD Milwaukee man is accused of shooting his lawnmower because it wouldn’t start. Keith Walendowski was charged with felony possession of a short-barrelled shotgun or rifle and misdemeanour disorderly conduct while armed. According to the criminal complaint, Walendowski said he was angry becase his Lawn Boy wouldn’t start Wednesday morning. He was quoted as telling police: “I can do that, it’s my lawn mower an my yard so I can do what I want”. A woman who lives at Walendowski’s house reported the incident. She says he was intoxicated. YIKES! Six years and three months in the clinker for shooting a lawnmower? Looking at the state of my own lawn mower I’d actually give him a knighthood. Anyway, here’s a less bizarre story and it’s from Kelowna, British Columbia, my place of residence for the month. This article is a much cheerier business and for all the men out there can I just suggest we join together in a wave of shallowness to applaud this fantastic, feelgood story. “Nursing students in bikinis and scrubs will be washing cars for a good cause next weekend in Kelowna. About two dozen students are expected to participate in the car wash set for the Petro-Canada at Highway 97 and Leathead Road on Saturday from 9 a.m. to 5 p.m. Along with washing vehicles for a donation, the students will also be offering to test people’s blood pressure. The students are entering the third year of the Bachelor in Nursing program at UBCO in September. But they’re already planning for their fourth-year educational trip to the African nation of Ghana. They’ll take along a large shipment of medical supplies and other resources to help improve health care delivery in Ghana’s northern rural communities. “We are getting moving on this project now, despite only going into year three of the program, because we are determined to do something huge,” says Nicole Arnt, chair of the Global Nursing Citizen’s fundraising group. I’m practically beyond comment on this story, (certainly within the bounds of public decency) so I’ll just say very well done girls and good luck with your charitable efforts.